Impingement syndrome and rotator cuff disorders are common causes of shoulder pain. These conditions are difficult to differentiate clinically. Both are chronic, painful conditions that result from inflammation, damage, or both to the structures that lie within the subacromial space (including the subacromial bursa and the rotator cuff tendons). The two conditions are treated in the same manner initially. Nonoperative treatment should begin with measures to reduce pain and inflammation, including activity modification, modalities, and nonsteroidal anti-inflammatory drugs (NSAIDs). If this is not effective, some patients may benefit from a subacromial corticosteroid injection. However, a study comparing single-dose subacromial injections of betamethasone (7 mg) and lornoxicam (8 mg) in 70 patients with subacromial impingement syndrome found that whereas the patients in the NSAID group achieved rapid functional recovery that partially extended into the intermediate term, the results were inferior to those seen in the steroid group. The authors suggested that a single lornoxicam injection may be an alternative only in cases where corticosteroids are contraindicated. Diagnostic joint injection, with or without a corticosteroid, can help determine whether shoulder pain involves the structures that lie within the subacromial space (ie, subacromial bursa or rotator cuff). 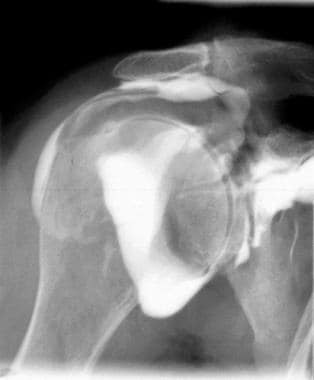 This can help differentiate impingement syndrome from other shoulder disorders, such as osteoarthritis of the glenohumeral or acromioclavicular joints and labral tears. If pain resolves or decreases after injection, then the pain is likely to be attributable to inflammation of either the subacromial bursa or the rotator cuff. Presence of contrast medium in subdeltoid-subacromial bursa signals presence of complete rotator cuff tear. 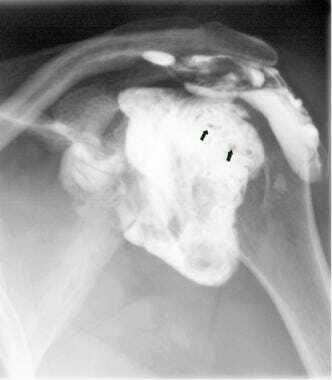 Complete rotator cuff tear with presence of contrast medium in subacromial-subdeltoid bursa. Also note multiple irregularities in synovial fluid, shown as multiple filling defects. Therapeutic joint injection provides pain relief and functional improvement in symptomatic subacromial impingement syndrome, rotator cuff disorders, and adhesive capsulitis. This is accomplished through delivery of the corticosteroid to either the subacromial bursa or the rotator cuff. Bacteremia, cellulitis of overlying skin, and adjacent osteomyelitis are often considered absolute contraindications for subacromial injection because of the potential risk of seeding the joint with bacteria. In these situations, the procedure should only be performed when septic arthritis is strongly suspected as the cause of overlying inflammatory changes, and only after consultation with an orthopedist. Relative contraindications include chronic infection distant from the injection site, allergy to the injectate, diabetes mellitus, and uncontrolled coagulopathy. Meislin RJ, Sperling JW, Stitik TP. Persistent shoulder pain: epidemiology, pathophysiology, and diagnosis. Am J Orthop (Belle Mead NJ). 2005 Dec. 34 (12 Suppl):5-9. [Medline]. Peripheral joint, soft tissue and spinal injection technique. Braddom RL, ed. Physical Medicine and Rehabilitation. 3rd ed. Philadelphia: Elsevier; 2007. Chap 25. Shoulder. Griffin LY, ed. Essentials of Musculoskeletal Care. 3rd ed. Rosemont, IL: American Academy of Orthopaedic Surgeons; 2005. Section 2. Dong W, Goost H, Lin XB, Burger C, Paul C, Wang ZL, et al. Treatments for shoulder impingement syndrome: a PRISMA systematic review and network meta-analysis. Medicine (Baltimore). 2015 Mar. 94 (10):e510. [Medline]. Lee JH, Lee SH, Song SH. Clinical effectiveness of botulinum toxin type B in the treatment of subacromial bursitis or shoulder impingement syndrome. Clin J Pain. 2011 Jul-Aug. 27 (6):523-8. [Medline]. Çift H, Özkan FÜ, Tolu S, Şeker A, Mahiroğulları M. Comparison of subacromial tenoxicam and steroid injections in the treatment of impingement syndrome. Eklem Hastalik Cerrahisi. 2015. 26 (1):16-20. [Medline]. Aksakal M, Ermutlu C, Özkaya G, Özkan Y. Lornoxicam injection is inferior to betamethasone in the treatment of subacromial impingement syndrome : A prospective randomized study of functional outcomes. Orthopade. 2017 Feb. 46 (2):179-185. [Medline]. Shams A, El-Sayed M, Gamal O, Ewes W. Subacromial injection of autologous platelet-rich plasma versus corticosteroid for the treatment of symptomatic partial rotator cuff tears. Eur J Orthop Surg Traumatol. 2016 Dec. 26 (8):837-842. [Medline]. von Wehren L, Blanke F, Todorov A, Heisterbach P, Sailer J, Majewski M. The effect of subacromial injections of autologous conditioned plasma versus cortisone for the treatment of symptomatic partial rotator cuff tears. Knee Surg Sports Traumatol Arthrosc. 2016 Dec. 24 (12):3787-3792. [Medline]. Jones A, Regan M, Ledingham J, Pattrick M, Manhire A, Doherty M. Importance of placement of intra-articular steroid injections. BMJ. 1993 Nov 20. 307 (6915):1329-30. [Medline]. [Full Text]. Eustace JA, Brophy DP, Gibney RP, Bresnihan B, FitzGerald O. Comparison of the accuracy of steroid placement with clinical outcome in patients with shoulder symptoms. Ann Rheum Dis. 1997 Jan. 56 (1):59-63. [Medline]. [Full Text]. Cunnington J, Marshall N, Hide G, Bracewell C, Isaacs J, Platt P, et al. A randomized, double-blind, controlled study of ultrasound-guided corticosteroid injection into the joint of patients with inflammatory arthritis. Arthritis Rheum. 2010 Jul. 62 (7):1862-9. [Medline]. [Full Text]. Blair B, Rokito AS, Cuomo F, Jarolem K, Zuckerman JD. Efficacy of injections of corticosteroids for subacromial impingement syndrome. J Bone Joint Surg Am. 1996 Nov. 78 (11):1685-9. [Medline]. Aly AR, Rajasekaran S, Ashworth N. Ultrasound-guided shoulder girdle injections are more accurate and more effective than landmark-guided injections: a systematic review and meta-analysis. Br J Sports Med. 2015 Aug. 49 (16):1042-9. [Medline]. Page MJ, Green S, McBain B, Surace SJ, Deitch J, Lyttle N, et al. Manual therapy and exercise for rotator cuff disease. Cochrane Database Syst Rev. 2016 Jun 10. CD012224. [Medline]. Molini L, Mariacher S, Bianchi S. US guided corticosteroid injection into the subacromial-subdeltoid bursa: Technique and approach. J Ultrasound. 2012 Feb. 15 (1):61-8. [Medline]. [Full Text]. Rutten MJ, Maresch BJ, Jager GJ, de Waal Malefijt MC. Injection of the subacromial-subdeltoid bursa: blind or ultrasound-guided?. Acta Orthop. 2007 Apr. 78 (2):254-7. [Medline]. [Full Text]. In 77-year-old woman with long history of chronic right shoulder impingement, posterior approach for subacromial injection is performed. Video courtesy of James R Verheyden, MD. Ultrasonogram shows needle penetrating bursa (right side of image) prior to injection of medication. Courtesy of Nicholas Goyeneche, MD, Ochsner Health System. Medscape Drugs & Diseases thanks James R Verheyden, MD, Consulting Surgeon, Department of Orthopedic Surgery, The Orthopedic and Neurosurgical Center of the Cascades, for assistance with the video contribution to this article.